The stone-built tower now houses eight bells which are rung from the ground floor – so no climbing of stairs is necessary! A wood and glass screen separates the ringing room from the nave. Sited at the west end of the Church the tower is heavily buttressed and, owing to the ‘black death’, took 25 years to build with work starting in 1345. Square holes, formed by the wooden scaffolding used during the tower’s construction can be seen in the walls. Listen to the bells. (1MB MP3 file. This is part of a recording of Frensham bells made by Cantate Recordings who have kindly given permission for its use. There is a cassette and CD available comprising a selection of ringing on Church bells in the Guildford area, including Frensham, available from Cantate Recordings. Please visit their website for more information." The bells were originally a ring of 5 bells cast by Ellis Knight of Reading in 1627. One of the bells was re-cast in 1658, during the period of Cromwell, and this is probably the reason that no Founder’s name or marking appear on these bells. A treble (ie. the lightest bell, with the highest note) was added in 1897, to commemorate the Diamond Jubilee of Queen Victoria, when the present oak frame was also installed. The bells were re-tuned and re-hung on modern headstocks and ball-bearings in 1952 by Taylor’s of Loughborough; the fifth bell was also re-cast at this time. Two more trebles were added in 1973 by the Whitechapel Bellfoundry to complete the present ring of eight bells. The bells range in weight from the treble at 170 kg to the tenor at over 500 kg; the largest bell (the tenor) is 1 metre high and 85 cm across its mouth. Bell ringing is well within the capabilities of virtually everyone, with no musical knowledge needed and being able to count the only maths required. It is an eco-friendly activity that stimulates the brain and helps to keep you fit. In learning to ring you will be part of a global group of friends, start a life-long learning experience, maintain a traditional skill, and serve your community. COME AND HAVE A GO!! We ring for Sunday morning services at St Mary’s, and generally practice on Monday evenings, from 7.30pm to 9pm. 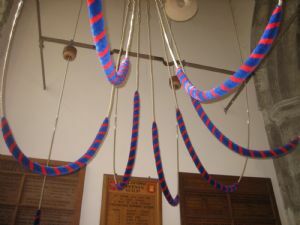 We also ring for special occasions (such as Remembrance Sunday, when we ring the bells ‘half-muffled’ as a mark of respect, and New Year) and for weddings. – or come along to see us on a practice evening or Sunday (excluding the first Sunday in a month, when the service is held at the Church of the Good Shepherd in Dockenfield). We will be very pleased to see you!